Relyence Weibull enables you to perform life data analysis on a wide variety of failure data. Relyence Weibull is built to maximize the analysis of your life data by enabling you to discover failure trends, predict future failure characteristics, and evaluate your failure data using Weibull techniques and other related distributions. Relyence Weibull supports a variety of data entry formats for your life data. Relyence Weibull supports the analysis of various types of life data. Starting with the most basic case, Relyence Weibull supports a list of times that represent failures. You can enter this time-based data in either an exact time format, or specify it in terms of time intervals as start times and end times. You can add to this basic failure time information by including a quantity, or the number of items which have failed for a particular time point. You may also choose to specify suspensions as part of your life data, allowing you to include data about units failing due to a different failure mode or continuing to operate. Relyence Weibull supports several distribution types for performing your analysis. The goal of Weibull analysis is to evaluate your life data and find a distribution, or failure curve profile, that best fits your data. If you prefer to use a particular distribution for your analyses, you may set the distribution directly. Or, you can use the built-in Best Fit feature to provide guidance for selecting the distribution that best suits your data. Relyence Weibull supports the following distributions: Weibull 2-parameter, Weibull 3-parameter, Lognormal, Normal, Exponential 1-parameter, and Exponential 2-parameter. 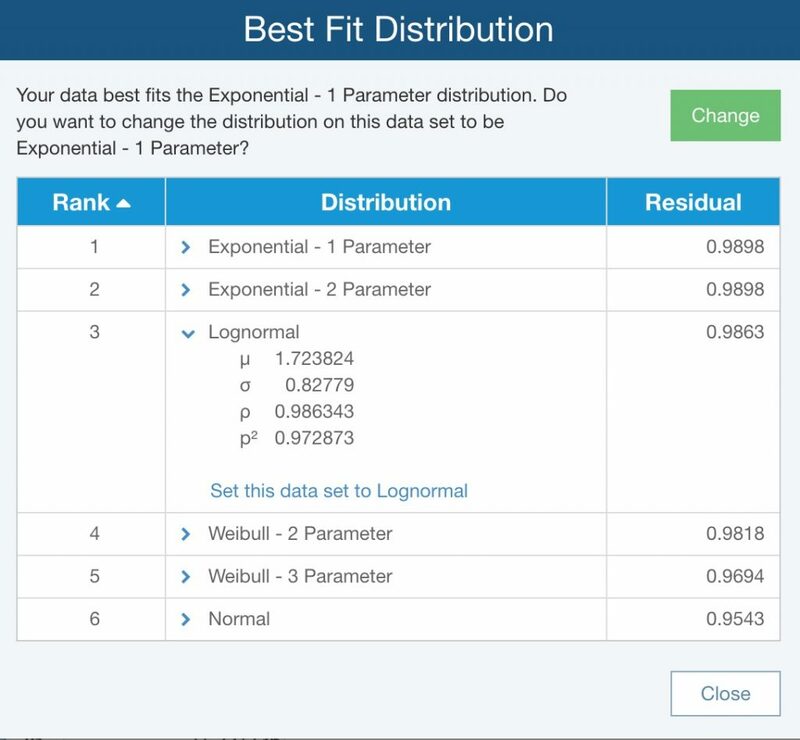 Relyence Weibull supports various distributions and also includes a Best Fit analysis feature to aid in determining the distribution best suited to your data. Relyence Weibull supports several Estimation Methods and Median Ranking Methods for your analysis. Relyence Weibull supports the following estimation methods: MLE (Maximum Likelihood Estimation), MMLE (Modified Maximum Likelihood Estimation), and Ranked Regression. When MMLE is selected, you can choose from either the RBA Median or RBA Mean type of MMLE. 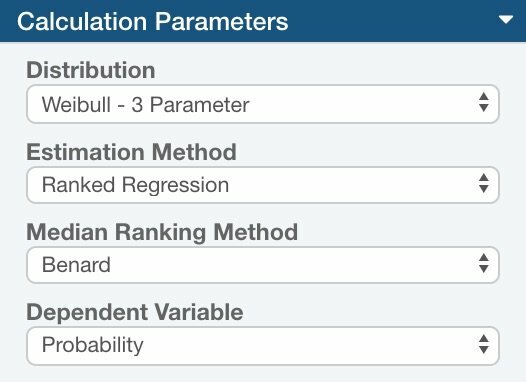 If Ranked Regression is selected, you can choose from either Time or Probability as the dependent variable. Relyence Weibull also offers support for a variety of Median Ranking Methods, including Median, Benard, Mean, Hazen, and Kaplan-Meier. You can enter your life data directly into Relyence Weibull, however, you may want to import data from outside sources. Due to the nature of life data, you may have information in a variety of formats and from varying sources. In order to make your data gathering easy and streamlined, Relyence Weibull supports two ways of importing your life data. 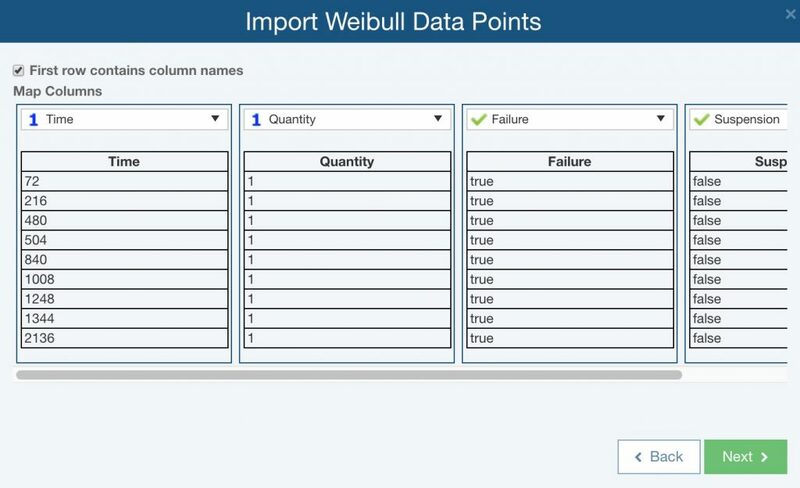 First, you can simply copy and paste failure data from an Excel spreadsheet directly into the Relyence Weibull Data Points Table. Alternatively, you can use Relyence’s flexible and intelligent Import feature. The Relyence Import capability guides you step-by-step through the process of importing your externally-sourced data. You can then save your Import for later reuse if you plan to do multiple imports. Relyence Weibull's Import feature offers step-by-step guidance for gathering your life data from various sources and formats.